How do you transfer money to your friend or family member. And how do you get money when you start working online? Your answering is obviously using internet banking, debit card or through credit card…correct? But what when you wanted to get money from overseas or transfer to overseas? Then obviously you need to use some other means to transfer as banking may or may not provide you this facility and even if they allow then it cost you very high. So in this situation we can use one best option that is “PayPal“, A world biggest money transfer service facility. This post we specially design for those who are new to paypal and provide all information like how does paypal work and how to use PayPal step by step(Practically). So before move to more depth let’s first know what paypal is. PayPal Holdings, Inc.is an American group Founded in 1998 and now become World’s most popular “middleman service” for online payment system. Online based money transfers serve up as an electronic choice to the conventional paper methods similar to checks as well as money orders. Paypal let you transfer money to any person in 190 countries without worrying about security concern. Paypal are one of the best means to transfer money from one person to another and mainly when you need to transfer overseas. Note: 90% of PayPal sales come from overseas customers. Why PayPal is so popular? You can imagine popularity of Paypal by it’s number of user, More than 179 million active customer accounts in 26 currencies and 203 nations PayPal serve. Fast service: You will get money from other country in few second of time. Mass payment : You can send mass payment in just one go. Trust: More than 179 million help you to get trust on Paypal. Client interaction: You can send invoice to your client directly. Free: Paypal is free for buyer means when you send money to vendor then you do not need to pay any bucks. 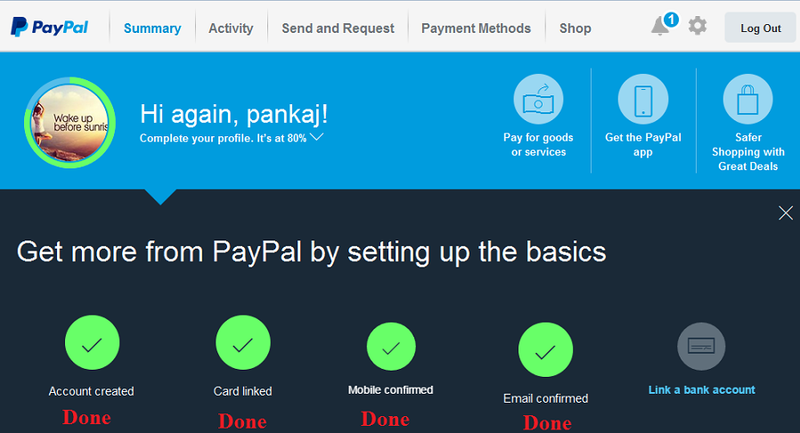 What all one can do using Paypal? Transfer or receive money from any person across 190 nation. Purchase or sell goods on many online e-commerce websites. You can make continuation of your subscription like any service which required monthly payment. PayPal allow you to transfer money from one person to other by using email address, as email is unique for each user like IP address & bank account so it give uniqueness to transfer or and receiver. You just need to open account with valid email address and need one bank account or credit card to associate with PayPal account.You can transfer money through bank account and receiving money in same account via PayPal. Paypal is much secure as compare to other way of transfer money. PayPal as secure as other bank account and it also make a new layer with email address so either party cannot see other’s card information or bank information. PayPal Always keep your information secret and that is key of its great success. Every transaction from your PayPal account confirm by email which associate with account. Having a large team of online security expert it becomes user choice to transfer money safe. Note:- Please don’t use the same password on PayPal which you are using on other account like gmail & Facebook. How much fees one need to pay to PayPal? On buying stuffs- It is free to use PayPal for buying anything from online world or from any vendor.The funds withdrawn from the user’s credit card or bank account. International sales: A currency conversion fees may apply . One good thing in PayPal is you do not need to pay anything until you get paid for selling something. Very easy to setup and easy to use. Faster, safer and more convenient. There are no monthly setup and cancellation fees. Easily use through mobile device. Buy with just your email and password. When it comes to getting payment online, there’s no larger name than PayPal. The e-Bay possess company gives equally value to businesses & individuals to use tools in payment processing as well as access that money instantly. 1. Flexible Online Payments : Getting paid online can be a little difficult, particularly for latest merchants. PayPal not only permit you to take money for other PayPal accounts, it also offers your clients the alternative to pay via credit card. Users can send money utilizing your email address or you can utilize PayPal’s e-commerce features to add buttons as well as shopping carts to your website. 2. Easy Access to Funds : Once you’ve acknowledged payment through PayPal as well as have been granted right to use to it, moving as well as using it is simple. If you’ve already sign up for the free of charge PayPal debit card, you can utilize that card anywhere debit cards are taken — including utilizing it with an ATM to take out your money. Finally, a lot of merchants permit you to disburse for goods as well as services quickly online via PayPal. 2. Fees as well as Freezes:- When running your money in PayPal, there are the two major concerns: fees associated with utilizing PayPal as well as knowing that PayPal can freeze up your account at several time for almost any reason. 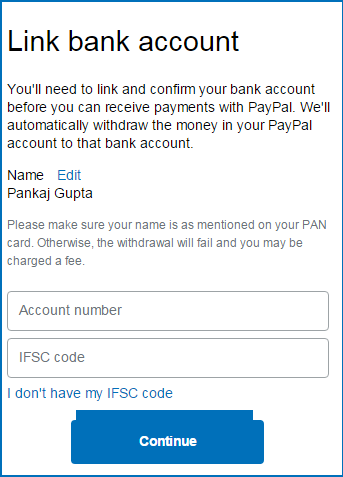 Step 1: Firstly open Paypal website paypal.com and click on signup button at top right side of webpage. Here is what it looks like on my screen.. Step 2: Choose whether the registration for individual or for business purposes – in this instance we are choosing individual then fill all required information and click on Agree and create Account button as illustrated below. Note:-You can upgrade this account to business purpose from dashboard. 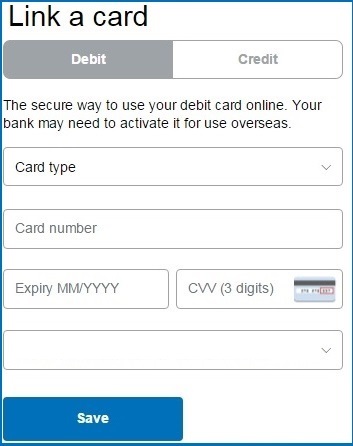 Step 3:- Here you need to fill credit card information or you can skip it for later time. If you have provided information then click on link card button else click on I’ll link my card later. Now you get into your PayPal account. In next step you need to complete basic setting as given in below images. Step 3: Now link your credit card or debit card with PayPal account. So to accomplish this task please click on Link a credit or debit card as below. Once you click on above link then it redirect you to another screen where in you need to provide information related to credit card and debit card. Step 4: After providing both credit card and debit card information you need to confirm your mobile number by clicking Confirm mobile link. Once you click on link , it will prompt new screen where in you need to click on confirm as below. Once you click on confirm link, system send verification code on mobile number register with PayPal account.so please provide code and get confirmed. Step 5: Once you confirmed your mobile digit then we need to move ahead to confirm email so click on confirm email link as showing below. Once you click on link it ask you to send mail to your registered email address..then system send verification mail like below. 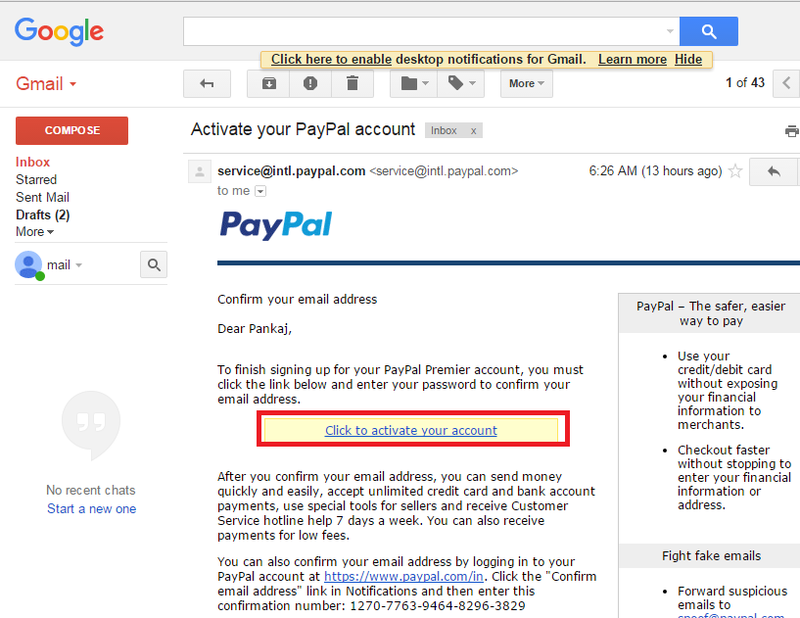 Please click on click to activate your account link to verify your email for PayPal. Once active then you can see below image..
Can you see?…If yes then great we will move ahead to link bank account with Paypal account.so you can pay instantly with direct debit worldwide.In order to do this please tap on Link a bank account. Once you tap on link it ask your account number and IFSC code ,so fill both information and click on continue …if you do not have IFSC code then you can Google with your bank address or click on I don’t have my IFSC code and select your bank information. Once you provide both information then PayPal will verify your bank account by send your account two small deposits in your account then you need to enter exact amount in text box of PayPal to verify.It may take 24 hours to transfer you this amount. Once all verification done then you can easily use right away to to transfer or receiving money. Note:- Please make sure Your password should be complex and don’t reveal it to any one. 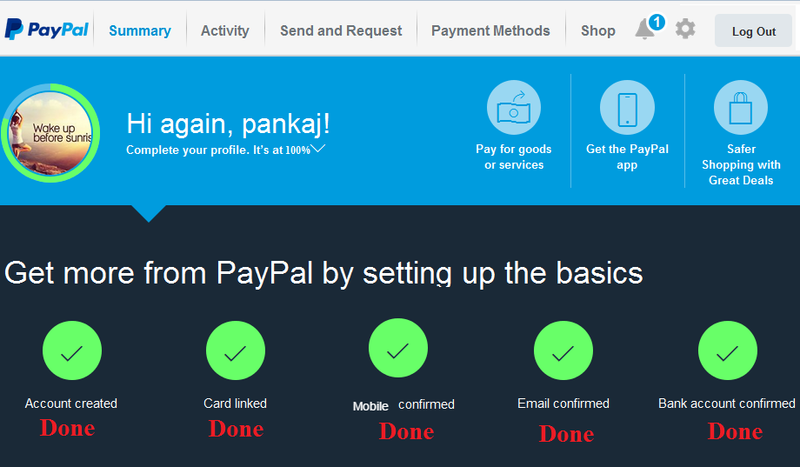 Hope you like this blog post and know how does paypal work and how to use paypal. Now you can easily create Paypal account and start working online as well as get money from overseas.